Everybody pictures what their home would look like with a lush, beautiful lawn. While it may be easy to imagine, it is going to take some dedication if you want to turn your dream into a reality. Even the best lawns can go bad if they are not properly cared for. You can’t hope to achieve the ideal lawn if you are unwilling to invest some time and effort. Additionally, you will need to get the right tools if you want to cultivate an enviable lawn. Invest in a good lawn mower, and consider getting a battery powered weed wacker or grass edge trimmer. While the amount of work that goes into maintaining a high quality lawn may seem like too much for a busy person, it’s far more manageable when you break down the tasks and create a lawn maintenance schedule. To stay on track and achieve your best lawn yet, be sure your schedule includes fertilizing, mowing, watering, edging, and weed removal. For most lawns, fertilization needs to be done at least twice a year. Depending on the grass type, you will need to fertilize your yard at least once in the spring, and then again in the fall. Generally, homeowners should wait until mid-spring to start fertilizing. It is the beginning of the growing season, and will guarantee that the soil has thawed. 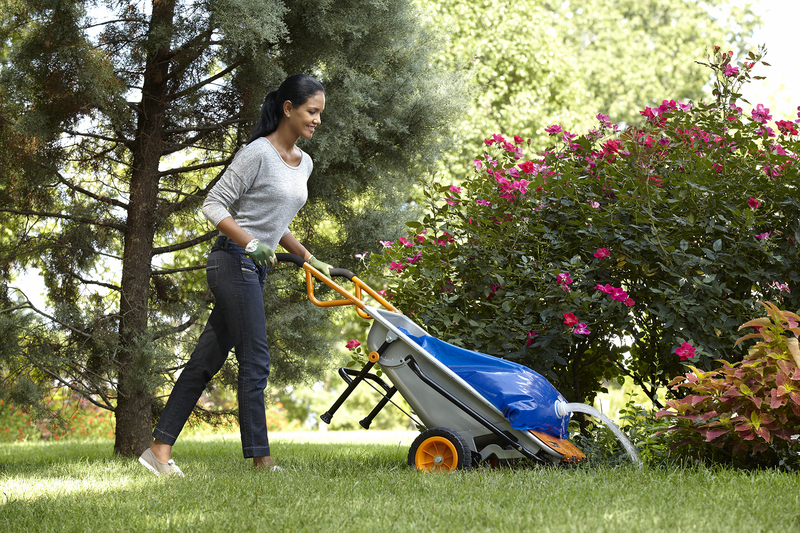 Depending on the size of your lawn, fertilizing it can take a lot of time and effort. If you have a large area to cover, make it a little easier on yourself by breaking the lawn up into sections and doing a different piece each day until the entire job is completed. Mowing the lawn is going to be a weekly chore for most homeowners. When it comes to the cutting height, it largely depends on the type of grass in your yard. If you don’t know the type of grass, retaining a height of 2-3 inches is a good rule of thumb. You should also mow the lawn when it grows to a third higher than its ideal height. The idea is to leave enough grass so it creates a slight canopy to shade the ground. If your mower cannot fit in some spaces or some areas of the ground are not suitable for the machine, a grass trimmer can come in handy. With a battery powered weed trimmer like the GT Revolution 20V 12″ String Trimmer / Edger / Mini-mower, you can get all of these hard to reach spots without the extra hassle. With a 20V battery, this weed wacker/lawn mower should have enough power for most lawns, and it easily converts between the different functions. Watering is another task that should be done at least once a week. Be aware that your watering schedule can vary depending on where you live and the amount of rainfall your area gets. In general, the average lawn should receive about an inch to an inch and a half of watering per week. You could do this all at once, or break it down into two or three shorter watering sessions throughout the week. To measure the amount of water your lawn is receiving, you could buy an irrigation system that has sensors or simply measure the water from your sprinklers using containers. Something as simple as an empty can will do, but the most important thing is that the container has straight sides. Just place the can in an area covered by the sprinkler and see how long it takes to fill a half inch. If it takes 30 minutes, that means you need to run the sprinkler for an hour to get a full inch. If you are going to go through the trouble of developing healthy grass, you might as well edge the lawn, too. This is another task that needs to be done about once a week, although it does not necessarily have to be done right after mowing. You could use your electric grass trimmer for this task by turning the head vertically, or there are other options. If you are looking for the best battery powered weed eater to use for edging, you should check out the 56V 13″ Cordless String Trimmer & Wheeled Edger. It works well for all of your standard grass trimmer tasks, but also has an adjustable head that pivots for edging. Along with that, this battery powered weed trimmer has removable wheels that make getting precise edges around the lawn easy. A well-maintained lawn should be resistant to weeds, but they can still appear against your best efforts. Most experts turn to herbicides for issues with weeds, but they need to be used carefully. When misused, herbicides can be harmful to people, animals, and even the turf itself. If the weeds do not respond to herbicides, you may need to pull them out by hand. There are even some situations where you may need to use your electric or battery powered weed wacker to cut the weeds down to size. By establishing a clear schedule when it comes to your lawn maintenance, you can easily achieve the yard you’ve been dreaming of. The addition of tools like a battery powered string trimmer or buying the best battery powered weed eater for your budget can make a big difference, too. They’ll make the work go faster so that you don’t waste all your time pulling out weeds or pushing an ancient lawn mower around your property all day. Lawn maintenance is easier when you have the best tools. Shop WORX today for your new grass trimmer/hedger! Be sure your schedule includes fertilizing, mowing, watering, edging, and weed removal.